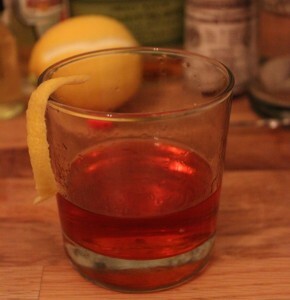 The ritual of making a Sazerac is time-honored and taken very seriously. In playing around with it, I’ve found that following these guidelines does make for a better-balanced drink. Start with two Old Fashioned glasses (or one O.F. glass and a mixing glass). Cram one Old Fashioned glass with ice (and maybe a little water) to cool it down. Also, you’re going to want a thin layer of water in there for the Absinthe rinsing. Next muddle the sugar cube and the bitters (or mix with the simple syrup) in the other glass until combined. Then add the whiskey and an ice cube or two. Mix for a bit until the drink has cooled, but don’t let too much ice melt or it’ll come out thin. Dump the ice out of your old fashioned glass and add a few drops of Absinthe (I bought a little dropper and use three solid squirts per-glass). Coat the sides of your glass with Absinthe. Strain the whiskey mixture into the glass. Cut a lemon strand and twist over the glass to get the citrus oils in there. Then rub the rind on the rim. Purists will say that the twist should not actually enter the cocktail, so consider hanging it off the side of the glass, rather than dropping it in. Finally, sip slowly and enjoy the robust, complex flavors as the whiskey warms and delights. The drink will change slightly as it sits, so it’s nice to take your time and experience the full range it has to offer. This amazing drink seems to be experiencing a resurgence in the recent cocktail revolution. In part, I imagine, because of the re-legalization of Absinthe—although Herbsaint was long used as a substitute. 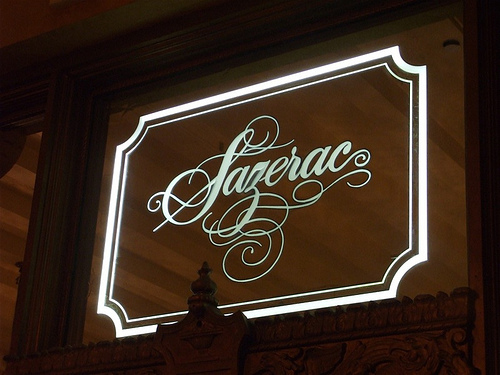 I first came across it at a wonderful San Francisco bar named Mr. Lew’s Win Win Sazerac Emporium. Yes, it is as awesome as it sounds (although recent renovations have detracted from the you-have-to-be-in-the-know feel of the place.) After a number of attempts (and asking the Win Win girl how she makes hers) I think I’ve gotten the hang of the drink. Including a nifty trick of throwing the glass in the air to do the Absinthe coating. In conclusion, you have to give this wonderful cocktail a try. I’m sure it will delight you and anyone you serve it to.